//We had the great opportunity to work with the production team at Daughter and Sons on a SportsNation homage to the classic NES game, Mike Tyson’s Punch-Out!! 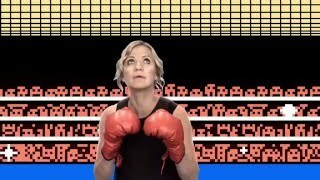 Powerhouse Animation got the chance to recreate the iconic game scenes to transport Michelle Beadle, Max Kellerman, and Marcellus Wiley into an LA version of the Punch Out world, where they train Beadle to become a video game heavyweight skilled enough to take on pixelated Manny Pacquiao and Floyd Mayweather at the same time. Video games, especially the classics, are near and dear to Powerhouse animators. Our team made sure to stay 100% true to the scenes and sprites from the original game, while making new dynamic close-up shots, and customizing the training sequence to look like an LA skyline. We used a demo reel and various footage of the actors against a blue screen as guidance for each shot. The animators carefully created each scene and dropped the actors into the Punch-Out!! world. The delightful final result kicked off SportsNation’s coverage of Fight Week 2015. Good luck beating Pacquiao and Mayweather, Beadle!